[Markets] China Accelerates Renewed Gold-Buying Spree "To Diversify Its Reserves"
After China's official gold reserves rose for the first time in around two years (since Oct 2016) in December, Beijing appears to have joined the global gold rush, increasing its gold reserves for the second month in a row in January to 59.94 million ounces. As we previously noted, China has long been silent on its holdings of gold as many countries are turning away from the greenback. The value the country’s holdings of the precious metal reached US$79.319 billion, increasing by more than $3 billion compared to the end of last year. In January, China dropped to sixth place among the world’s largest holders of the yellow metal behind Russia. With its 67.6 million ounces of gold, Russia now stands in fifth place behind the US, Germany, France, and Italy. 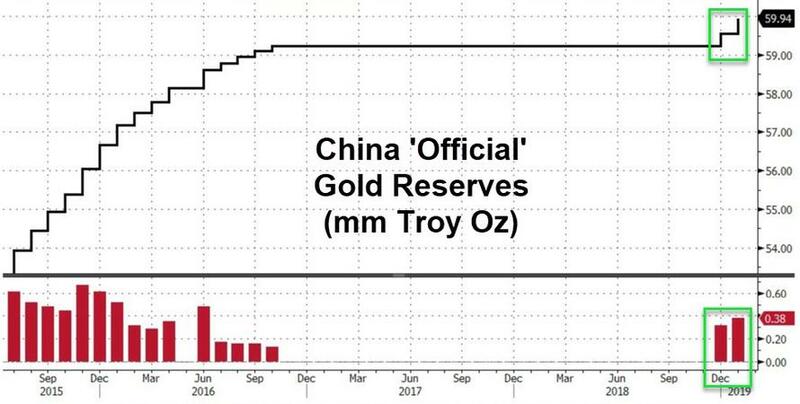 Crucially, the size of the gold addition are far less important than the signaling effect - why did China decide now was the right time to publicly admit its gold reserves are rising? It is hard to see how the US can match a sound-money plan from China. Furthermore, the US Government’s finances are already in very poor shape and a return to sound money would require a reduction in government spending that all observers can agree is politically impossible. 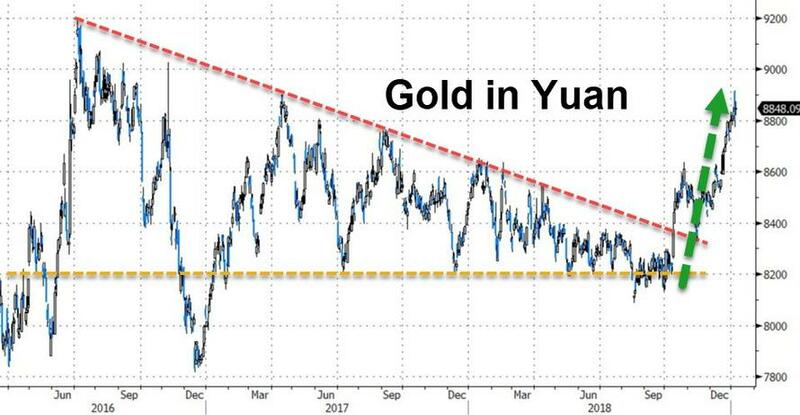 This is not a problem the Chinese government faces, and the purpose of a gold-linked jumbo bond is not so much to raise funds; rather it is to seal a price relationship between the yuan and gold. Whether China implements the plan suggested herein or not, one thing is for sure: the next credit crisis will happen, and it will have a major impact on all nations operating with fiat money systems. The interest rate question, because of the mountains of debt owed by governments and consumers, will have to be addressed, with nearly all Western economies irretrievably ensnared in a debt trap. The hurdles faced in moving to a sound monetary policy appear to be simply too daunting to be addressed. Ultimately, a return to sound money is a solution that will do less damage than fiat currencies losing their purchasing power at an accelerating pace. Think Venezuela, and how sound money would solve her problems. But that path is blocked by a sink-hole that threatens to swallow up whole governments. Trying to buy time by throwing yet more money at an economy suffering a credit crisis will only destroy the currency. The tactic worked during the Lehman crisis, but it was a close-run thing. It is unlikely to work again. Because China’s economy has had its debt expansion of the last ten years mostly aimed at production, if she fails to act soon she faces an old-fashioned slump with industries going bust and unemployment rocketing. China offers very limited welfare, and without Maoist-style suppression, faces the prospect of not only the state’s plans going awry, but discontent and rebellion developing among the masses. For China, a gold-exchange yuan standard is now the only way out. She will also need to firmly deny what Western universities have been teaching her brightest students. But if she acts early and decisively, China will be the one left standing when the dust settles, and the rest of us in our fiat-financed welfare states will left chewing the dirt of our unsound currencies. 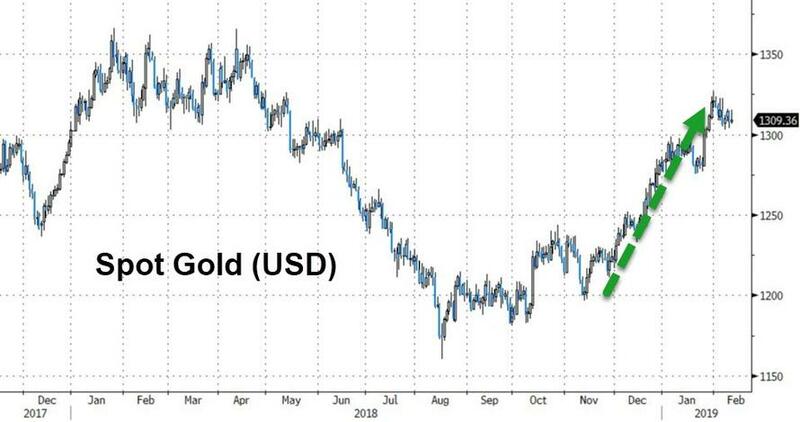 Is China's "signal" an explicit warning of the end to the dollar era that has existed since August 1971, when gold as the ultimate money was driven out of the monetary system.